Summary: A hundred years ago, in an alternate United States, monsters and humans have been at war as long as anyone can remember. John Winchester raises his sons in a world already overrun by the supernatural, in which humans are often on the defensive, pushed ever further west. 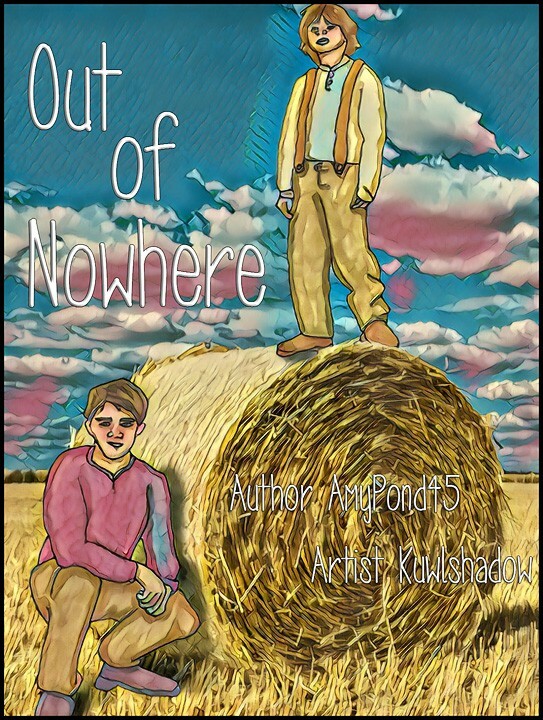 Against this backdrop, Dean and foster-brother Sam grow up relatively carefree on a ranch near Lawrence, Kansas, protected and heavily warded, until the day Dean learns the truth about his mother, the mysterious hunter who abandoned her family when Dean was four. With his new knowledge, Dean figures out even better ways to protect his family and his home. But will it be enough? Written for the 2018 spn_j2_bigbang. A/N: In this story, Adam is the oldest son of John Winchester, born 11 years before his half-brother Dean. The story is inspired by Wuthering Heights by Bronte and East of Eden by Steinbeck, as well as my love of old pioneer narratives and westerns. “Out of Nowhere” is a Johnny Green jazz standard that inspired the Star Trek theme. Miracles Out of Nowhere is the title of a song and film about the history of the band Kansas. I am indebted to onlythefireborn for her fabulous beta work, to kuwlshadow for her amazing artwork, and to wendy for moderating the spn_j2_bigbang each year. Thank you all! Oh, it's posted! I'm so glad. It's absolutely the first thing on my list to read, once the obligatories are cleared off for the day. WHEEEEE! LOL yes, the story I feared might never get posted is finally posted! Thank you for your enthusiasm! I’ll be spending tomorrow reading other bangs — yours is already downloaded! Convalescing has its perks!